Jade plant from 1993 till 2010. I thought I would take a few minutes and talk about the Jade plant. It is one of the easiest plants to grow, and keep alive. Over the years I have had jade just about everywhere I have lived. My first jade was actually my mothers. We had a large plant in our sun room. Every now and then one of the branches would get damaged and it would get stuffed in some soil with no real thought, and another plant would be born. When I went to college I took one of these plants. It went from college to my first home. When I moved on in my life that jade plant was still going strong, and had gotten pretty good-sized. Sunset on Dunstan Beach, CA in April 2011. Now I am in California. I found a bit of jade when I went to Stinson Beach and Dunstan Beach in April 2011. There was this hedge of jade. I had never seen anything like it. Well a small branch was broken, so I took it home with me. Again, going back to my youth, I just stuck it in a pot. Now I did take the trouble to ‘skin’ the bottom of the branch, so that all the woody covering was brought back to the green stem. I have found this is important when you have a branch from an older plant that gets almost a bark like covering. 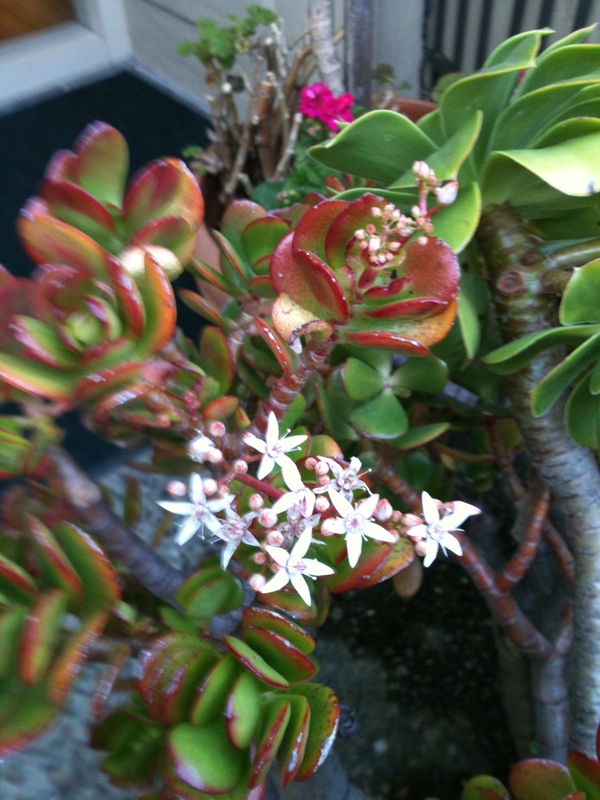 Jade plant in flower, Carmel Mission Inn, Carmel-by-the-Sea, CA, December 2011. This plant I have had now for 2 years. It has been happy, and growing strong on the deck. I am hoping that as it gets older it will start to flower. There is a lovely Inn in Carmel by the Sea. This hotel has pots and pots of jade. When I go in December each year the jade plants are all flowering. It seems to be linked to the limited sun, and the cool, that causes it to flower. I was told once that the plant needs to reach a certain age before it will flower, but I am not so sure about that. My mother’s plant is almost 40 years old, and it has never produced a flower. Although that plant has been trimmed with in inches of its life many times. If you want to start with an easy, and enjoyable plant. If it will be your first attempt to have a house plant, or even something to start your small space garden, jade is just wonderful. Wonderful. I have to say I have a special place in my heart for the Jade plant. It brings happy thoughts of my mother’s home, and that always leads to more good memories. I am considering taking a cutting and working it like a bonsai, I am not really sure where to start though. google it? Altho I think Portulacaria afra with tiny leaves is a more popular choice for a bonsai.